If you are looking for ideas for making a fruit tray for a Bridal Shower, a or a Baby Shower you have come to the right place! I recently made a special fruit platter for my daughter Karissa's bridal shower, and decided on a rainbow fruit tray! 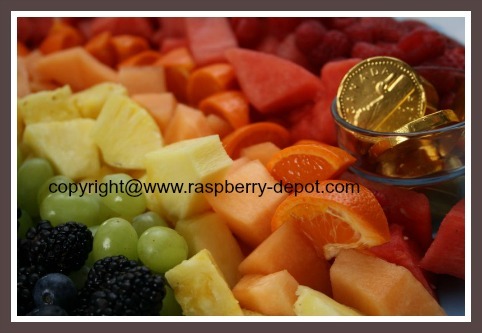 Rainbow Fruit Tray - Great Idea for Bridal and Baby Showers! 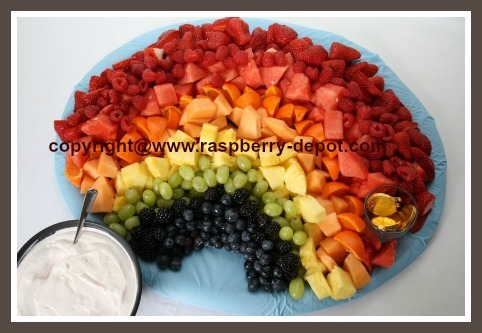 I think a rainbow fruit platter is perfect for a shower, won't you agree? Follow the step-by-step instructions below and enjoy all the compliments you will receive! The fruit tray recipe below serves about 25 - 30 people. If you wish to serve less people, simply use the recipe below, and adjust the amount of fruit, tray size, etc. as needed. 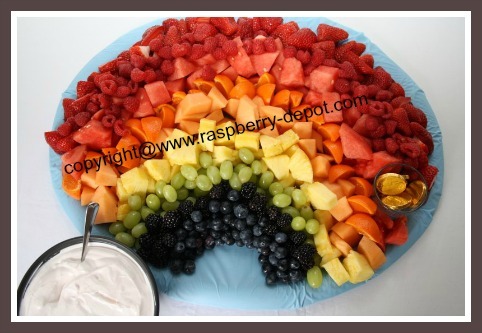 Fun Tip - you can also use this rainbow fruit arrangement idea to make a fun snack size treat for a child ... it won't be hard to get kids to eat a variety of healthy fruits this way! Note - the list of fruit below is what I used to make the rainbow fruit tray pictured above, however, you can easily substitute different fruits that you prefer or have on hand, for example: kiwi slices, purple grapes, honey-dew melon, or red grapes. Fruit which tends to turn brown quickly such as apples and bananas are not recommended for this fruit presentation. Choose a large tray. If you do not have an oval tray, a rectangular tray will work as well. The oval tray I used measured about 15" x 17" (not including the raised edge). 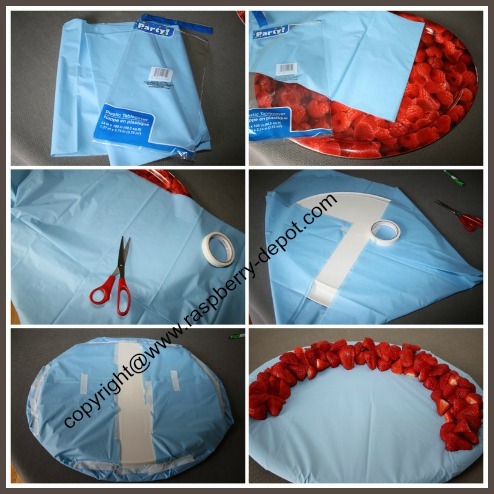 Use the plastic table cloth cover to cover the tray (fold it several times), tape at bottom side (see images). Note - if the tray has a raised edge, be careful not to pull the plastic too tight; ensure that the edge of the tray is not incorrectly made level with the bottom of the tray (keep the edge structure). Prepare all the fruit as needed. If desired the pineapple, cantaloupe and watermelon can be cut into chunk size pieces the evening before and refrigerated in separate containers until you are ready to assemble the fruit. Or, cut up these fruits just before making the fruit tray. About one hour prior to starting to assemble the fruit tray, I gently rinsed all the berries and grapes under cold water and allowed them to dry on a plate lined with paper towel. This helps prevent the berries from becoming mushy. 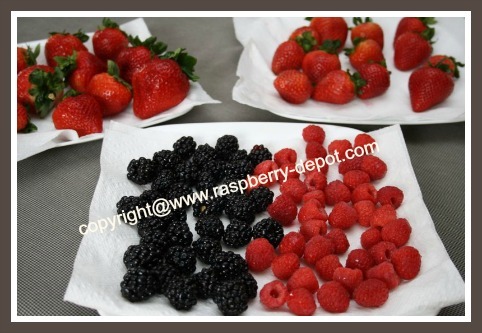 If the kitchen is quite warm, allow the berries to dry on the paper towel in the refrigerator (see images above). Cut the clementine oranges into small sections using a sharp knife, or peel them and divide into segments. 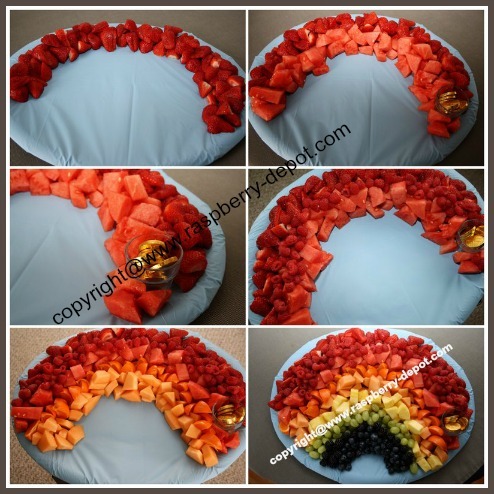 Add the strawberries to the tray, carefully establishing the curve of the rainbow design. Add the remaining fruits to the tray (refer to the images below for an example of how to place the fruit). Add the container with chocolate coins at the end of the rainbow, optional. Prepare dip, and serve as a side dish, optional. I used my all-time favorite fresh fruit dip that is easy, quick and that everyone will love! I prepare it the evening before, so it's all ready to go! It's so simple you won't believe it! DIY Fruit Tray and Dip Done!